You can apply to multiple seasons with either the same character or different ones. However, if you are accepted for any season you can not play in any others. So basically you can apply to several seasons, but then whichever one has 5 players first is the one you join and you'll no longer be considered as applying to the others. Alright! I think I'm done with my Application! I think I'm done, pending any feedback . I’m going to apply with an Aasimar Paladin, a character which seems tailor-made for Barovia, but the horror vibe isn’t really my bag. I think instead I’ll apply for Seasons 2, 3, 6 or 7 instead. Normal posting expected until the end of June! Appearance: At nearly 7 feet tall, this grey skinned, brown haired behemoth won't win any beauty contests. His eyes are black pools swimming in egg whites, and he dyed the skin around his mouth red. He wears leathers, nothing that matches, and sometimes still bearing a head. He has a deep gravelly voice, which can be beautiful or haunting. Personality: A fierce, raging, lunatic in skins. Once you get to know him though, he's a fierce lunatic who cares. He has no trouble bonding with people who give him a chance. He loves his wife, his children, and his tribe, but has left them all behind to explore and bring back tales and treasures. He's not very smart, but is able to tell who is trustworthy. History: Red Maw was born on the plains during a raid, it was 15 years later he was similarly raiding and took a human girl prisoner. She found him horrifying, and screamed all through their first days together, but once she heard him singing she was enthralled. The two exchanged tales that they had heard, and sang songs to each other. She convinced him to return with her to her home in Baldur's Gate, where he was less than welcome. He won friends quickly by his unexpected personality and charm. The two have 3 children now, and Red Maw, is looking to make a name for his children to be proud of. I'm driven by a wanderlust that led me away from home. I place no stock in wealthy or well-mannered folk. Money and manners won't save you from a hungry owlbear. Bond: I'm still seeking the enlightenment I pursued in my pilgrimage, and it still eludes me. A brief description of your character's appearance, personality, and history: Wyran grew up in a rural village in the foothills of the Desertsmouth Mountains near the River Tesh. From his earliest years, he received visions in his dreams from an angel calling himself Mykiel. Compassionate and hopeful, Mykiel planted the idea of a great destiny in Wyran's soul. Raised to be a capable huntsman and outdoorsman, upon reaching the age of majority Wyran departed home on a spiritual pilgrimage driven by Mykiel's visions. During the pilgrimage, Wyran mostly journeyed alone, deep into the Desertsmouth Mountains, subsisting by hunting and gathering. Led by his guardian angel, Wyran completed a series of increasingly difficult and dangerous initiation tasks that tested both strength and spirit. He became aware of great battles in the heavens and the planes, and that he ultimately was going to have a role in those battles. Some of this time was spent under the tutelage of a mysterious old man who resided in the mountains, who taught Wyran about matters both spiritual and practical, including an education in the Celestial and Draconic languages. Having heard rumors about the Cult of the Dragon's activities in Phlan, the mysterious old man made clear that the time had come for action, that Wyran was ready to enter the world, seek allies, and do battle against evil. Following along the River Tesh, Wyran prepares for the first steps on his journey towards his destiny. While completely devoted to his cause, Wyran seeks out as well opportunities to experience and share the beauty of creation. Whether a story well-told, a song well-sung, or a beautiful melody well-played on his mandolin, he seeks to bring joy into the lives of everyone he meets. Last edited by gjf2a; 01-02-2019 at 01:28 AM. Only 1 unfilled spot in Season 1 with gjf2a applying. I don't want to be be season 1, I'm sure of that. 2, 3, 6, or 7 is all fine though. Personality Traits: I am utterly serene, even in the face of disaster. Ideal: Self-Knowledge: If you know yourself, there's nothing left to know. (Any). Bond: My isolation gave me insight into a great evil that only I can destroy. Flaw: I’m convinced that I’m marked for a great destiny, and so I see everything and everyone around me as mere tools to achieve it. Description: Verity’s golden hair and ivory skin seem to glow with a warm light and her smile draws people to her, which makes her height somehow less imposing. She habitually wears loose, comfortable clothing or well-fitting, practical armour, depending on the occasion. She makes friends easily, at least in part because people tend to know instinctively that they can trust her, they can open up to her and she will keep their confidence. What isn’t so obvious is that it is partly because she considers everyone else’s concerns to be so minor that she doesn’t tell secrets. Compared to her sense of her own destiny, the indiscretions of a scullery maid or the schemes of an ambitious trader are of little consequence. Backstory: Verity’s mother, Wildra, had lived in a small hut in The Vast, near the source of the Fire River with no contact with another living being for many years when Verity was born. This miracle, Wildra had known, was bestowed on her by her god, Torm, so that her daughter may fulfil some great destiny. This was a constant in Verity’s life from the start, even if the details changed. Depending on when you caught Wildra it may have been that Torm had impregnated her while in the form of a golden swan, or it may be that he came to her as a tempest, the wind and rain pelting her body and giving her child, or even that he spoke to her in a dream and then she was with child. Verity grew up with only her mother for company. Wildra was an intelligent woman, a follower of Torm who had gone into hermitage in order to study and meditate to get closer to her god. Which meant that she had everything she needed to give her daughter a reasonable education in situ. She learned all about the body, the maladies which could affect it and how they could be remedied. She learned about the gods, about their long and bitter battles and how they continued even now. And the rest? The history of men, the vagaries of magic, or the mysteries of nature? Well, Wildra felt that such things were of little consequence. The most important thing which Verity was taught was the importance of her own destiny. Torm had chosen her, had placed her here to serve a purpose. What that purpose would be remained vague, but it was important, and Verity had to be ready to heed the call. Unfortunately Wildra was no warrior, so she could teach her daughter little of the martial ways. 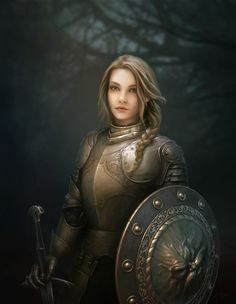 And so, at sixteen years old, Verity left her seclusion and travelled to Tantras with the intention of joining the Trueblades, a crusading order dedicated to Torm. Unfortunately they opted not to hire a young girl with no martial training and directed her to join the guards to get some experience. Undeterred, Verity did join the guards and served her full five year tour, learning as much as she could along the way. By the time her tour had finished she decided not to go back to the Trueblades, feeling that her destiny lay in another direction. She spent most of the money that she had saved to board a ship heading west, to Westgate, where she got a job as a caravan guard heading still further west.